With the ever increasing demand for a perfect smile we are facing various professional challanges. Lack of a tooth can lead to bone athropy. The neighbouring teeth, then, tend to close the empty space by leaning towards each other. So they lose their function, which affects chewing ability. The shape of face is deteriorated, especially when front teeth are missing. This also leads to speech sound disorder. Another function of teeth is to support lips and cheeks, but with teeth missing, a person can look older and more wrinkled as well as face psychological problems like insecurity or lack of self-confidence. However, life is more enjoyable with a beautiful smile. Depending on the number of teeth, their order and condition the restorations can be fixed or removable, or the combination of the two. The removal of tooth structure is necessary for the further functional and aesthetic rehabilitation. By using dental crowns and bridges we can restore the shape, colour, a tooth position or a missing tooth. 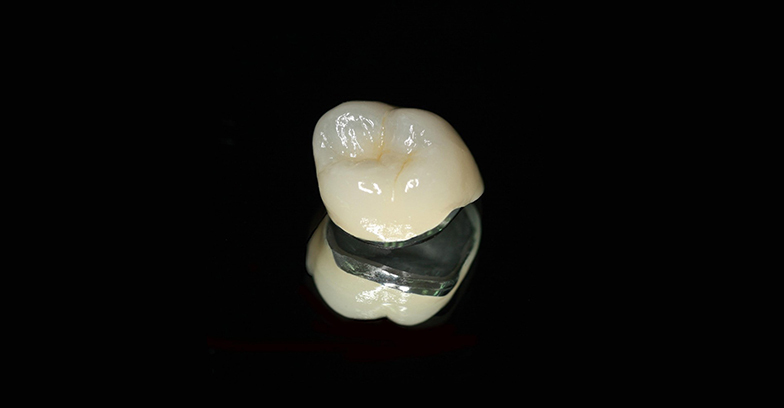 The crowns can be made with restorative materials such as ceramic and metal-ceramic. 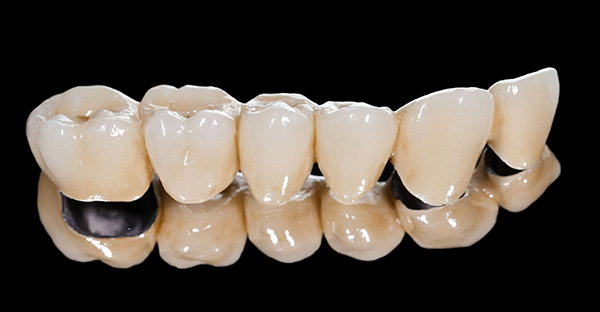 Metal ceramic crowns are made of metal framework covered with a layer of porcelain, whereas all-ceramic crowns are made solely of ceramic material. We recommend zirconia ceramic crowns. Due to its metal-free framework, the tooth gets translucent and natural appearance which blands in well with your teeth. The advantages of all-ceramic crowns over metal ceramic crowns are in their aesthetic features, biocompatibility with gum tissues (no allergic reactions), high mechanical resistance, reduced risk of pulp irritation owing to low thermal conductivity and does not cause a dark gingival pigmentation. Dental bridges are fixed replacemnts of one or more missing teeth and are attached to the adjacent teeth. They can metal ceramic or all-ceramic. Acording to the colour of the base, location of the tooth/teeth and translucency of the adjacent teeth we decide which material to choose for the bridge. Then a mould of addition silicon is made, which is a precise elastomer with high dimensional stability and pleasant to patient. When the situation in the mouth of a patient does not allow reconstruction with fixed prosthetics, the option is a mobile prosthetics. 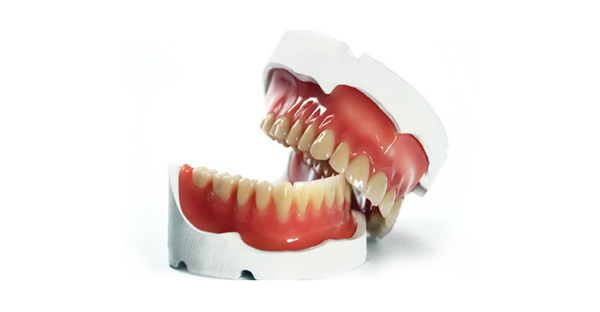 Depending on the status of the teeth there is a choice between partial or complete dentures. Complete dentures are meant for patients with total tooth loss. They are made of acrylic base with “false teeth” set in. Retention and stability is achieved by vacuum which is formed. A patient takes part in choosing the tooth colour, size and shape. Complete dentures improve the quality of life allowing easier chewing and talking as well as bring back smiles on your face. Partial dentures can be partial plate or partial skeletal denture. What makes difference is “the hooks” which attach the partial plate denture to the teeth, thus making partial skeletal dentures more comfortable for a patient. Unlike the plate in plate dentures, skeletal dentures have a big metal joint which is considerably thin offering greater comfort to the patient. Except for hooks, the skeletal dentures can be connected to a tooth with inlays, crowns, attachments, or double crowns and this kind of restoration requires a combination of dental procedures. 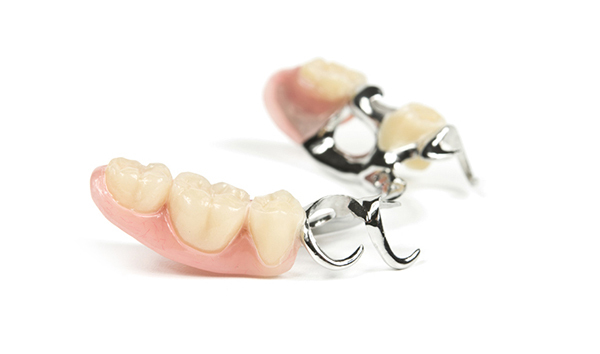 Attachments are precise elements which connect removable partial dentures to a fixed bridgework by using male/female locking mechanism. This system allows a patint to easily remove and place back their denture as well as maintain oral hygiene. Partial telescopic dentures have inner and outer crowns. Denture retention is achieved through the friction between the telescopic crowns. Partial or complete dentures covering or overlapping one or more natural teeth as well as natural roots are called superstructures. The presence of natural teeth gives necessary support, retention and stabilization to the denture. The cutting edge equipment, our professional knowledge and skills will provide painless treatment and make our patients feel comfortable. We use high quality materials such as GC materials, GRADIA DIRECT, Heraeus Kulzer, 3M ESME, DENSPLY, IVOCLAR, VIVADENT, White Smile flash, Straumann, Nobel Biocare, ALFA BIOTECH, Septodont.